After the death of Prophet Mohammad, attention was focused upon the expansion of the Islamic Empire; giving birth to caliphs and dynasties such as the Umayyad Tyrants who spread Islam by the sword. Yazid the tyrant was inclined to return to the clannish racism and Arab supremacy of pre-Islamic times. He was met with opposition from Hussain, the grandson of Mohammad who had risen to promote peace and reform. Imam Hussain refused to pledge allegiance to the terrorist Caliph Yazid, and was beheaded along with 72 of his family members and companions by 70,000 soldiers in the massacre of Karbala. During this time, Muslims as well as some Christians and Hindus commemorate Imam Hussain’s martyrdom. During these days, many prominent intellectuals and world leaders unite under the banner of Hussain. The ideological revolution of Hussain is a lesson for everyone to never refrain from fighting against terrorism, extremism and intolerant ideologies. 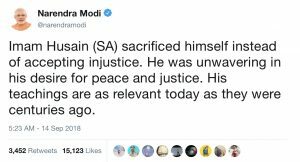 Last week, Prime Minister Narendra Modi commemorated the martyrdom of Hussain to emphasise the need for peace and justice.